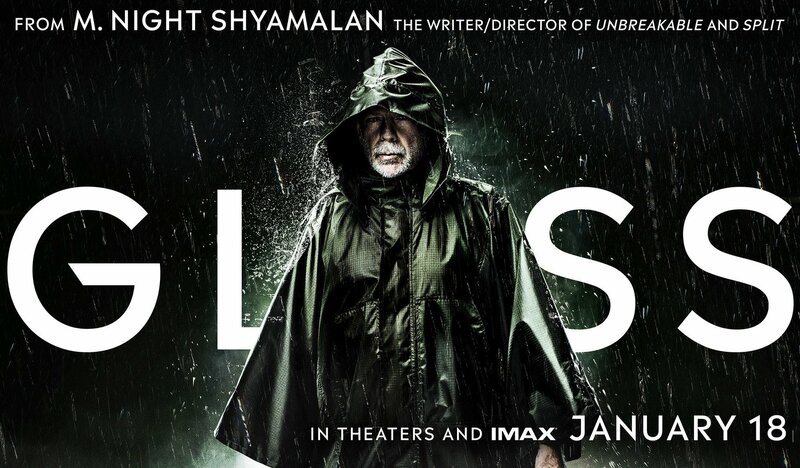 While it may not be breaking records, M. Night Shyamalan’s Unbreakable/Split follow-up Glass certainly refuses to shatter as the Universal superhero sequel held onto the #1 spot at the weekend box office. The film brought in $19 million domestically, giving it a -53% dip from its debut for a $73.5 million cume over here. The film added another $23.6 million from 55 markets internationally (where it is now open everywhere except China) for a worldwide total of $162.7 million, not bad for a movie that only cost around $20 million to make. Bruce Willis return as David Dunn in the film starring alongside James McAvoy, Samuel L. Jackson, Sarah Paulson, Anya Taylor-Joy, Spencer Treat Clark, and Charlayne Woodard. M. Night Shyamalan wrote and directed the film. STXfilms and Lantern Entertainment’s The Upside held onto second place for the weekend, dropping just 18.4%% from last weekend and bringing in another $12.2 million. The film has now brought in $63 million domestically. The Upside has also grossed $1.1 million internationally for a global total of $69 million. Directed by Neil Burger (The Illusionist, Limitless), The Upside stars Kevin Hart, Bryan Cranston, and Nicole Kidman and is a remake of the 2011 box office hit French film Les Intouchables. Warner Bros.’ Aquaman actually climbed one notch from 4th to 3rd place for the weekend with an estimated $7.35 million for a domestic total of $316 million. But the truly historic news was the $1.09 billion total the film has taken at the global box office, making it now officially the all-time DC Comics movie champ worldwide, besting The Dark Knight Rises‘ $1.084 billion global take! The DCEU movie is also the third largest WB movie worldwide, the studios’ 10th biggest domestic grosser and the 25th largest worldwide release ever. Directed by James Wan, Aquaman stars Jason Momoa, Amber Heard, Willem Dafoe, Patrick Wilson, Dolph Lundgren, Yahya Abdul-Mateen II, and Oscar winner Nicole Kidman. 20th Century Fox’s The Kid Who Would Be King garnered some great reviews but couldn’t find its audience, coming in at #4 domestically with a paltry $7.25 million, with an additional $1.94 million from 20 overseas markets for a worldwide total of $10.4 million. Hopefully the film from Attack the Block director Joe Cornish can find a wider audience through word-of-mouth. The $59 million dollar movie could still make a splash in its native UK when it opens on February 15. The Kid Who Would Be King stars Louis Ashbourne Serkis, Tom Taylor, Rebecca Ferguson and Patrick Stewart. Columbia Pictures/Sony Pictures Animation’s Spider-Man: Into the Spider-Verse held onto fifth place, adding another $6.15 million to its total and bringing its domestic haul to $169 million, and will soon become Sony Pictures Animation’s top domestic earner of all-time. Internationally the film took in $2.8 million for an overseas total $169.1 million and giving it a global total of $338 million. Directed by Bob Persichetti, Peter Ramsey and Rodney Rothman, Spider-Verse features the voices of Shameik Moore, Jake Johnson, Hailee Steinfeld, Mahershala Ali, Brian Tyree Henry, Lily Tomlin, Luna Lauren Velez, Zoë Kravitz, John Mulaney, Kimiko Glenn with Nicolas Cage, Kathryn Hahn and Liev Schreiber. After a slew of Oscar nominations, Green Book added 1,518 locations for a total of 2,430 for a $5.4 million weekend haul in sixth place. The 1960’s-set racial drama has taken in nearly $50 million domestically, plus $5.7 million this weekend internationally for a worldwide total of $59.3 million. Starring Viggo Mortensen, Mahershala Ali and Linda Cardellini, Green Book was directed by Peter Farrelly (Dumb and Dumber). Columbia Pictures/Bona Film Group’s family film A Dog’s Way Home fell to seventh place with a weekend total of $5.2 million, giving it a domestic total of $30.8 million. Directed by Charles Martin Smith, the screenplay is by W. Bruce Cameron & Cathryn Michon based on the book by W. Bruce Cameron. The film stars Ashley Judd, Jonah Hauer-King, Edward James Olmos and Alexandra Shipp with Wes Studi and Bryce Dallas Howard. Despite big stars like Matthew McConaughey and Anne Hathaway and buzz about the film’s WTF twist ending, Serenity didn’t make much of an impact on opening weekend, tallying $4.8 million from 2,561 locations for eighth place. Sony Pictures’ Escape Room slipped two spots to ninth place, adding another $4.27 million for a domestic total of $47.9 million. Produced on a reported budget of $9 million, the horror-thriller is a runaway hit for the studio and will likely see a sequel enter development soon. Directed by Adam Robitel, Escape Room stars Taylor Russell, Logan Miller, Deborah Ann Woll, Jay Ellis, Tyler Labine and Nik Dodani with Yorick van Wageningen. Last weekend’s surprise hit Dragon Ball Super: Broly, the latest feature film in the long running anime franchise, took in $3.6 million for the weekend. Released by FUNimation Films on Wednesday, January 16, the film has brought in $28.9 million total at the domestic box office so far. 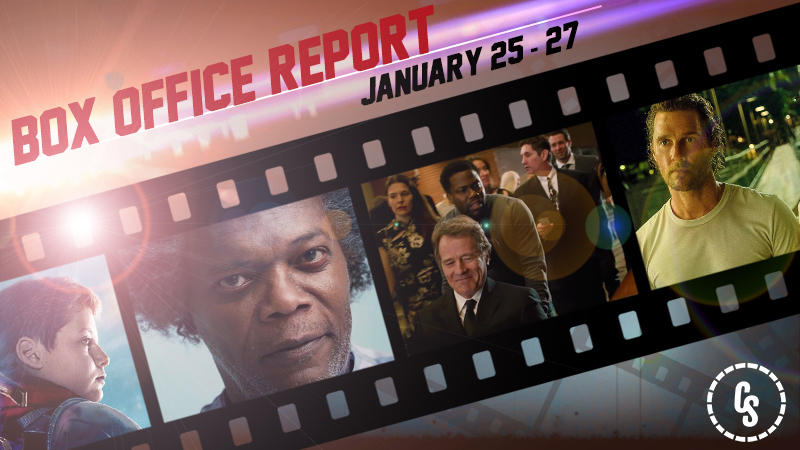 The post Glass Holds #1 Spot, Plus Aquaman is the DC Box Office Champ appeared first on ComingSoon.net.